Since 1985 New Zealand has operated with a floating exchange rate. Our currency is traded on the market, responding to changes in economic conditions here and around the world: subject to global events, interest rates, prices, and a range of other factors that affect the demand for our currency. In theory, this reflects the health of the New Zealand economy relative to others’ (although as Brian Easton explains it is complex, and distorted by speculation). It is normal for the exchange rate to be somewhat over or undervalued for periods of time, deviating from its “fair value”. 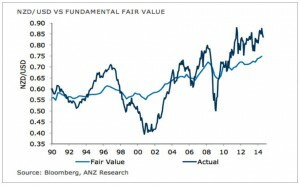 There is evidence, however, that the New Zealand dollar has been over-valued for much of the past decade. The damage from an over-valued currency is not always obvious, while the benefits are over-stated. Currency changes influence our economy in different ways, over different timeframes. In the short term, a strong currency makes imports or offshore consumption attractive: for example foreign holidays, electronic goods and imported capital goods. 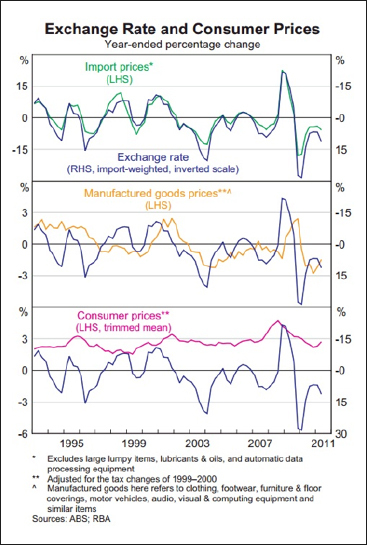 But consumer prices are least affected by the exchange rate, as the graph to the left shows. This graph separates the relationship between the exchange rate and import prices, manufactured goods prices, and consumer prices. There is a relatively small pass through of the exchange rate on consumer prices. This is not only a New Zealand phenomenon: A Reserve Bank of Australia (RBA) report “The exchange rate and consumer prices” found that a 10 percent appreciation of the Australian dollar reduced overall consumer prices by around 1 percent; an effect which was spread out over around three years. In the long term uncertain returns around a high dollar will impact investment and employment in the export or import competing sectors. If the currency is valued persistently above or below its “fair value” that displacement has the capacity to substantially distort economic development. Too high and the export sector is damaged, too low and the domestic sector carries too great a cost. A currency at fair value brings appropriate and balanced economic development in the medium and long term. This problem was highlighted recently in a conversation with the CEO of a large exporter who said, “If this business was not in New Zealand it would be five times bigger”. He went on to say that uncertain returns demanded a conservative approach to growth and balance sheet management to carry his business through the hard times of overvalued currency. This underlines the largely invisible economic impact of currency: as profits are hit by a rising currency and future profits are more uncertain, investment can be foregone, along with the growth that would flow from such investment; lost to the need for ever more careful management of uncertainty. The immediate benefits we all feel from a strong currency tend to outweigh the more subtle and long term impacts on investment and jobs in the tradable sector. Care is needed in order to ensure a balanced long term response to the currency issue. 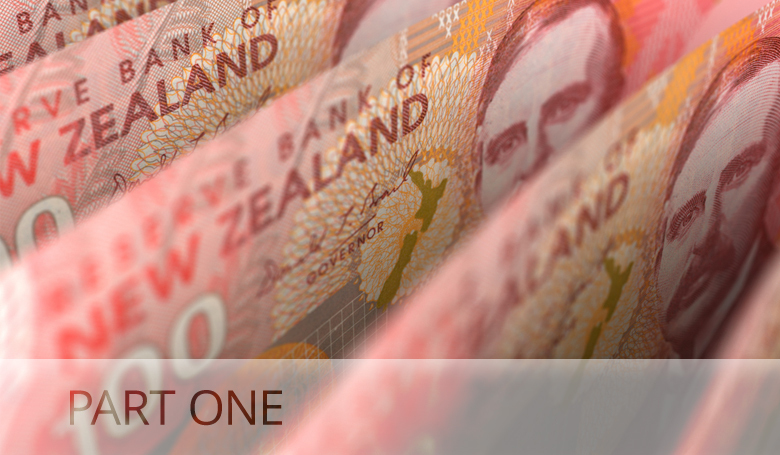 In recent years, the NZD has commonly been referred to as “overvalued”, but what does this mean? Traditionally an economy with low domestic inflation, strong domestic and export economic performance experiences exchange rate rises. The theory goes that a strong currency tracks a strong economy, and weak economies see their exchange rates fall – so the exchange rate should roughly track the performance of the real economy. When the exchange rate gets out of step, e.g. a strong exchange rate but a weaker economy, the idea of over or under valuation takes shape. This also brings in the idea of “auto-stabilisation”, where currency trades react to changes in economic indicators or other factors, moving the currency and stabilising it relative to the changing economic landscape. For example, strong commodity prices mean a strong currency for commodity-dependent economies, and weak commodity prices see the currency fall to buffer returns to commodity producers. 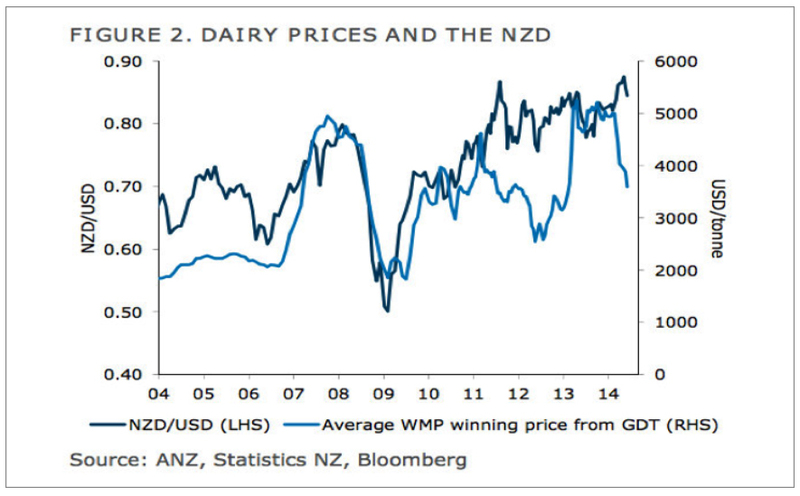 This has not happened in New Zealand in recent years, as the currency has moved out of step with dairy prices, failing to react to substantial falls in dairy prices, both in 2011-2012, and in 2014. How overvalued is the New Zealand Dollar? The graph below shows our exchange rate against the USD, compared to the “fair value”. 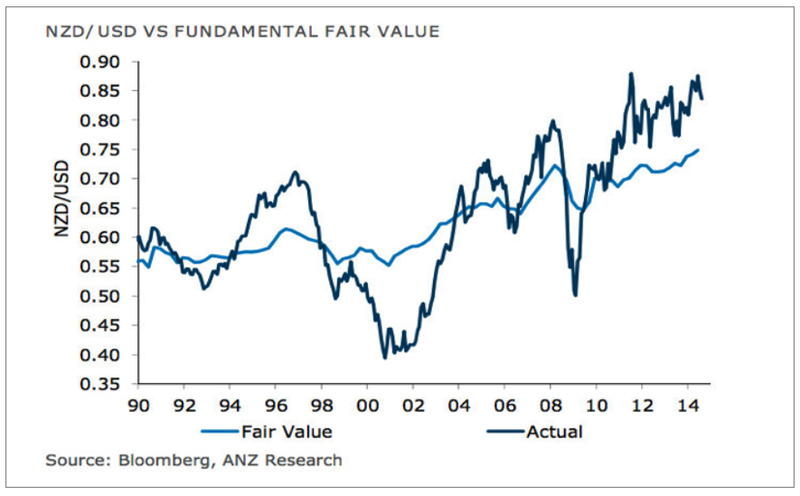 We can see a consistent and sustained overvaluation (actual above fair value) since around 2004. In this case “fair value” is determined by: relative inflation, interest rates, current accounts, and terms of trade, productivity and economic volatility – the economic fundamentals. A recent IMF report on New Zealand suggested our currency is currently 5 – 15 percent above the level that would be consistent with medium term fundamentals (economic performance, commodity prices, interest rates, etc). One of their models estimated an overvaluation of 13 percent, 9 percent of which is not explained by medium term fundamentals and policy drivers in our economy. Another report by the Peterson Institute of International Economics also estimated that our currency is overvalued by 15 percent. Government politicians are aware of these estimations: Finance Minister Bill English was quoted as saying, “Almost anyone who has looked at it comes to the conclusion it’s somewhere 10 to 15 percent overvalued”. Prime Minister – and former currency trader – John Key agreed that our currency is currently overvalued, and saying the “Goldilocks” level of our currency might be around 65c against the US. 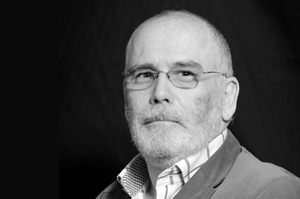 There is a general expectation that our currency will fall back and correct itself in time – but the questions remain: when will this happen; what will people think and do in the meantime; and, as a consequence, what will all these effects mean for our economy?